On December 21st, 2013, I recorded a fairly standard vlog about the winter solstice and my love of the month of December. At the end of it, I sang “Silent Night”. I had no idea that singing a public domain Christmas carol written in 1818 would set in motion a positively absurd series of events. 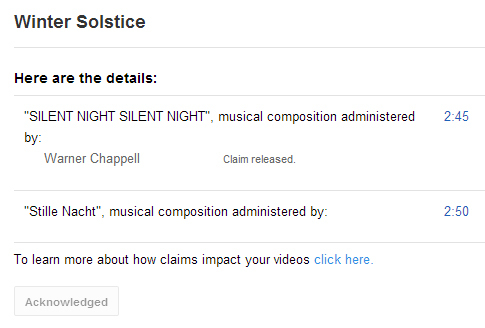 As I discuss in my latest video, uploaded late on January 5th and embedded above, my a cappella rendition of “Silent Night” sent me on a copyright claim roller coaster of frustration and insanity. After clearing an initial fraudulent automatic claim on my content from a generic organization of copyright enforcers, I was struck by not one, but three fraudulent claims by major record labels. All courtesy the highly flawed automated system that is YouTube’s content ID. Strangely, that stressful situation proved itself to be a stroke of luck. As timing would have it, this occurred right as the Internet at large was tearing its collective hair out about the content ID system. While I was fuming about my copyright troubles on Twitter, Mike Masnick tweeted at me to ask me if I’d be willing to share details, as he might want to write an article about it. So, when I set my frustration loose in blog form, screenshots and all, I sent him a link. I had no idea, at the time, who Masnick was, though the name was vaguely familiar. As it turns out, he’s the CEO and founder of Techdirt. Masnick’s Techdirt article went live on Christmas Eve, whereupon it drew the attention of writer & blogger Cory Doctorow (a name that should be familiar, at least in passing, to most denizens of the Internet…or at least to people who read the webcomic xkcd, as he’s been seen or referenced more than once). I was quite shocked to be told by FeedTacoma‘s Kevin Freitas, on Christmas Day, that I’d been written about on Boing Boing, and to see that Doctorow’s name was in the byline. It spiraled from there, with other tech blogs picking up the story from Boing Boing, a domino effect that I still haven’t seen the end of, with new blogs about it popping up even now (plus a brief appearance in Dan Bull‘s rap about YouTube and content ID). 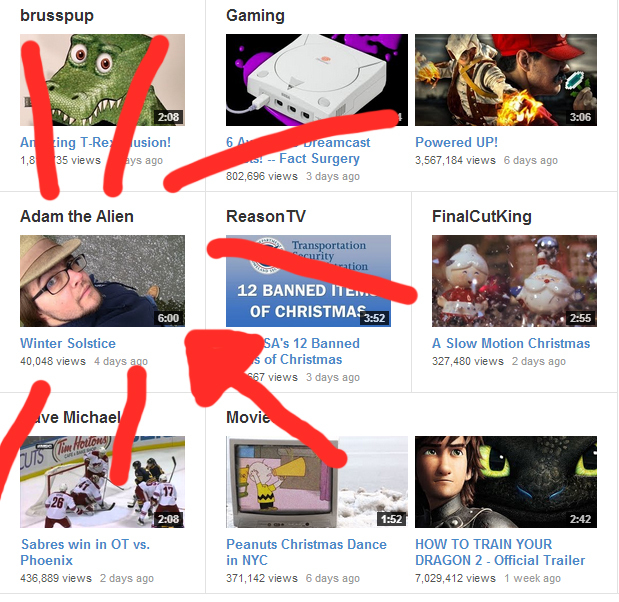 Somehow, presumably because it was embedded on Boing Boing, my video ended up on YouTube’s official “What’s Popular” page (and their front page, as served to people who aren’t logged in) for several days. I’m truly baffled as to how this happened, even with the Boing Boing feature, because it appeared in the “What’s Popular on YouTube” list even before it had very many views. In fact, according to YouTube Analytics, most of my views came from the video being featured by YouTube (either from than from the “What’s Popular” list or from the YouTube homepage), as opposed to the embedding on various tech blogs. “Winter Solstice” on the “What’s Popular” page. Maybe that was YouTube’s way of apologizing for the inconvenience caused by its own flawed system. If that’s the case, then apology accepted. As a result of the attention I gained from being screwed over by an automated system, I gained several thousand more views than I had any right to get with such a by-the-numbers vlog. As I write this, “Winter Solstice” has 215,216 views, making it my second-most viewed video (following the heavily-trolled “Fedoras Are Awesome”, the video /r/cringe and 4chan regulars love to hate). I’ve also experienced a net gain of 624 subscribers since Christmas Eve (771 gained, 147 lost). After a long plateau of subscriber count changes so minimal they were barely noticeable, that sudden jump feels amazing. “Winter Solstice” in the “What’s Popular” list. In the end, Warner/Chappell —the final holdout of the “Silent Night” content ID corporate copyright claimants— addressed my dispute and released its claim on December 27th, allowing me to re-monetize my video. A bit late, since both Christmas and the winter solstice were already fading into memory. Still, it was a relief to have the matter addressed in less time than the month the claimants were permitted to take, if they so wished. Side-by-side comparison of the content ID notification page, showing the vanishing claimant names. Click to enlarge. I do wonder, though, if my dispute would have been addressed as quickly, amid the holiday madness, if it weren’t for the press my situation garnered. It’s interesting to note that, as the press circulated most strongly across the Internet (even making it into Billboard’s morning news roundup, albeit at the bottom of the list), the names of the claimants on the page notifying me of the video’s current copyright status vanished one by one. Instead of seeing a list of past claimants, with a “claim released” note next to the company’s name, the specifics vanished and left me with blank spaces after the claim notifications. The “Winter Solstice” content ID notification page as of January 6, 2014. Note that the Warner/Chappell name remains visible, despite the claim having been released for weeks. The other claimant names all vanished in a matter of days. Nothing conclusive to be said here, but it’s quite curious. I’m honestly not sure if this is normal practice for content ID claims, or if the companies asked to have their names removed due to bad press. I kind of suspect it may be the latter, however, as the Warner/Chappell name —the one company who didn’t address my dispute until after the height of the blog buzz died down— remains on that notification page at the time of this writing. In the end, as teeth-grinding as the experience was, it produced more overall good than it did bad. My story was circulated around the Internet, prompting my friend Laura Cameron, also known as Ceres of the Dangerous Kids podcast, to declare me “officially Internet famous.” I got an increased viewership, a boost in search algorithms, and no small amount of support and flattery to make my Christmas a little more special. I contributed to an important discussion surrounding YouTube, content ID, and copyright. A discussion I hope continues with fervor and never stops, because there’s always something that needs to be fought or righted, some ground that needs to be held in the ongoing battle that is copyright. So for all the angering aspects of this experience, it was a net positive. Though that doesn’t mean I’ve come out of the copyfight without scars. And it certainly doesn’t mean it’s all over. While writing this, the punchline arrived: an e-mail from YouTube informing me that I needed to prove I had all the rights to monetize “YouTube and Copyright” —yes, the very video embedded in this post— within fourteen days. In the meantime, it has been de-monetized. Irony, you are a cruel mistress. My theme song is Pluto Vs. Neptune, by Driftless Pony Club. You can buy their albums from DFTBA Records. Does YouTube give you back the money the video continued to earn while it was ‘de monetized’? From my understanding, the video continues to earn money during this period, but the money is given to the copyright claimant (and YouTube gets their cut of course.) If they re-monetize your holiday video after the holiday is over, but don’t give you the money it earned during the high-view period, haven’t they stolen that money from you?